Race Facts: This may be the stupidest sponsorship in NASCAR. It was bad enough when it was the Centurion Boats at the Glen, but now it’s the Heluva Good! 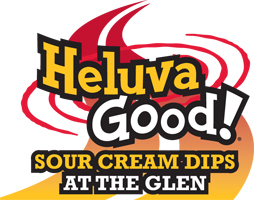 Sour Cream Dips at the Glen? I really hope that Heluva Good! Isn’t taking themselves seriously with the naming of this race… It’s the final road course race of the season, so maybe Woody can stop crying about how boring road racing is… Road course ringers are a pretty good bet this week, even though there are going to be three that don’t qualify. Patrick Carpentier is a safe choice because he’s locked in to the race via Michael Waltrip’s owner points. If I had to guess which three drivers won’t qualify, it’d be Tony Raines, Dave Blaney and Joe Nemechek. But don’t hold me to that… If you have access to NASCAR HotPass for the race, I strongly encourage you to ride along with the driver of your choice on Sunday . The available drivers are Kyle Busch, Jeff Gordon, Juan Pablo Montoya and Carl Edwards. Too bad they didn’t choose Marcos Ambrose, Robby Gordon or Tony Stewart. Robby Gordon: If you’re going to play Gordon at any point during the remainder of the season, now is the time to do it. He hasn’t had the equipment or resources to come close to being competitive on ovals, but Robby’s probably had his team working on the setup of this Watkins Glen car ever since the Sonoma race. I wouldn’t necessarily take Gordon to win or finish top five, but I think that if he keeps his cool and stays away from David Stremme, Gordon should run comfortably in the top 10 all day. Gordon’s best chance to win over the weekend may be in the Nationwide race. He’s running his own car there also, and I wouldn’t be surprised if he’s in Victory Lane on Saturday. Kevin Harvick: To a lesser degree, the same goes for Kevin Harvick, who has shown signs of turning his dismal season around lately. Harvick has won at Watkins Glen before, and was in contention for a great finish when he got into that unforgettable—but ultimately wimpy—“fight” with Juantoya. Harvick is a great sleeper candidate for the win. It is hard to believe that I’m calling him a sleeper, but that’s how 2009 has gone. Kyle Busch: Yeah, picking the defending race champion as a driver to watch is a bit of a cop out, but given Busch’s recent performance, like Gordon and Harvick, he’s looking for a rebound at Watkins Glen. Sonoma was a horror story for Busch, who ran well until he got shuffled into the back half of the top 10 and became a victim of—his own and others’—aggressive driving. If Busch qualifies up front, I think he’ll stay there all day. But if he gets shuffled back in the pack, I don’t like the odds of Shrub keeping his cool enough to calmly work his way back to the top. Kurt Busch: Unlike his brother, Kurt’s struggled at Watkins Glen. Big brother’s average finish is just 21.4, and his 10th place finish last year is the best he’s ever done in upstate New York. Busch is comfortably in the Chase, so he doesn’t have to gamble much, even though a win would be great for the Chase seedings. Busch shouldn’t be horrible on Sunday, just thoroughly mediocre. And do you want to pick mediocrity? David Ragan: What the heck has happened to Ragan? Has the dart lost his feathers again? He was an absolute weapon at Pocono on Monday, and it almost seems that he’s regressed since that sophomore season. It’s a great thing that UPS is so solidly behind him, because if they weren’t, he might have been the odd guy out at Roush-Fenway and not Jamie McMurray. Don’t count on Ragan doing anything special Sunday, as he’s finished 32nd and 30th in his first two trips to Watkins Glen. Greg Biffle: The Biff isn’t a horrible road racer, but he’s certainly not one of the circuit’s best either. He’s right on the cutoff of the Chase, and can’t really afford a terrible day, but his past history at Watkins Glen doesn’t bode well for a good finish. Biffle has finished 30th or worse in four of the six Watkins Glen Sprint Cup events he’s been in. However, for those looking for a glimmer of hope, those two finishes above 30th have come in the past two years. But either way, stay away from Biffle this weekend. Jeff Gordon: The King of Watkins Glen has struggled recently at the Glen, recording just one top 10–a ninth place finish–since he last won in 2001. But remember, it’s Jeff Gordon, and much like Denny Hamlin last week, Jeff hasn’t forgotten how to be successful at Watkins Glen. Gordon can afford to go for a win due to his comfortable points position and needs a win to prevent himself from being buried once the Chase starts. The Glen is as good a place as any for Gordon to get his second win of the season, and look for him to be in Victory Lane on Sunday afternoon, provided he doesn’t wheelhop the car going into turn one like he did in 2007.